As you might recall, my little 3 year old started pre-school last week (see her first day here). She’s going three days a week at a neighbor’s house and loving every minute of it! I thought I would do something special for her home classroom and kept seeing some neat school wreaths on Pinterest. LOVE that idea! Cute huh? 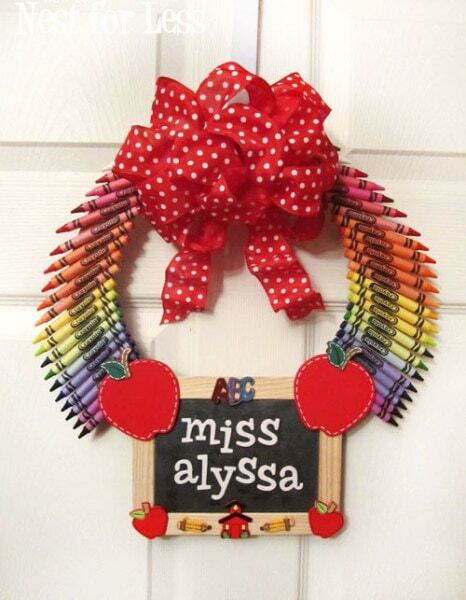 Here’s how I made the personalized teacher classroom wreath! 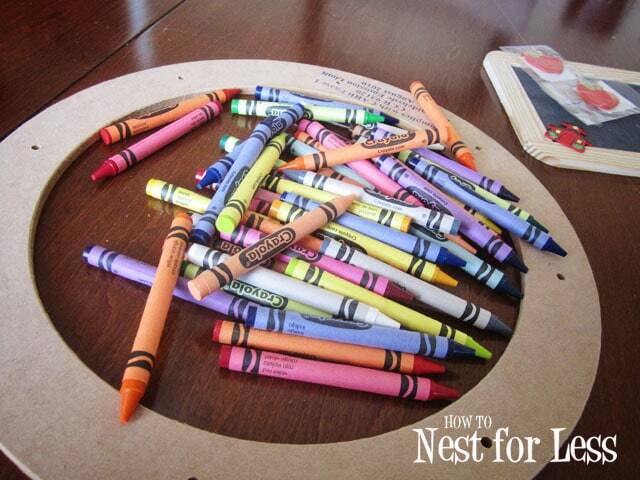 First thing I did was practice laying out my crayons to get the right feel of the wreath. I only used 2 boxes in my wreath instead of the 3 I originally purchased. I decided to use the crayons in a spectrum from red to purple and discarded the other colors. Once I knew my placement, I used my hot glue gun to attach the mini chalkboard. 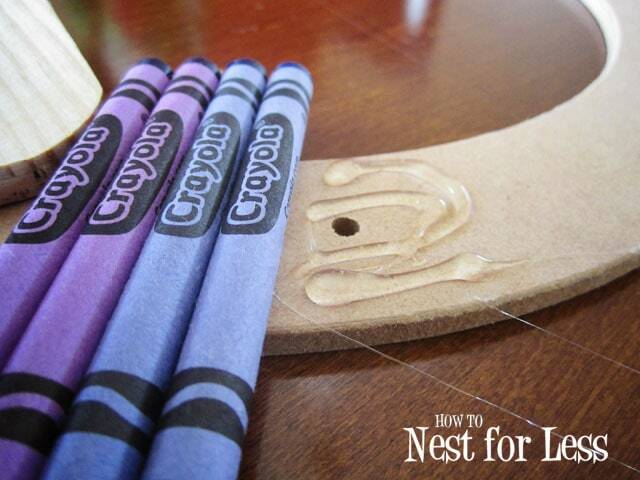 Next I started to glue the crayons around the craft ring. I started with purple closest to the chalkboard and worked my way up to the top with red. Here are all of the crayons glued. I left the space empty at the top since I knew I was going to place a large red and white polka dot bow there. 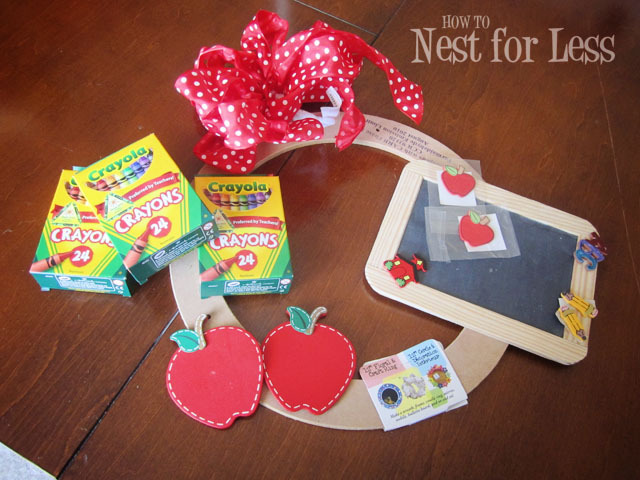 For the empty spaces near the purple crayons and chalkboard, I used the large craft wood apples and glued them into place. 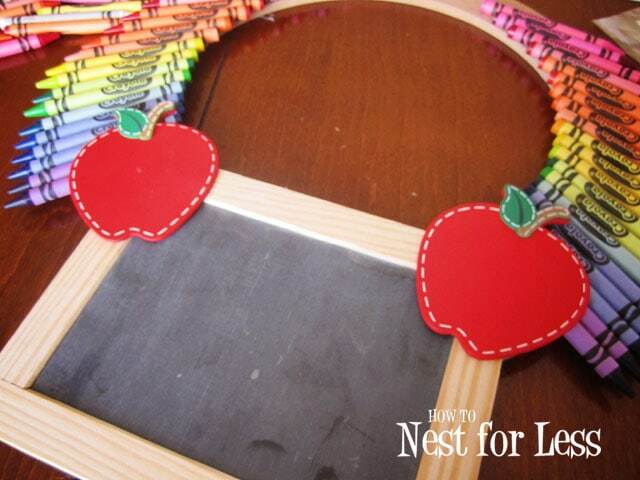 I used the smaller craft wooden pieces such as pencils and a schoolhouse to decorate the rest of the chalkboard. I purchased a large red and white polka dot wire ribbon from Michael’s with a 40% off coupon for the top of the wreath (originally $7). Last thing to do was place the glittery white Thicker stickers from Michael’s on the mini chalkboard to spell out my daughter’s school teacher’s name. And that’s it! Pretty simple and cheap project (entire thing was under $15). Plus what a great personalized gift for a teacher’s classroom door! Ahh! I love it, soo cute. Great idea. That is very cute! She will love it! That is way too cute (and very thoughtful). I’m always looking for teacher gift ideas, since my daughter just started Kindergarten. Thanks for sharing this! You did a fantastic job! That is really cute! It makes an excellent gift! 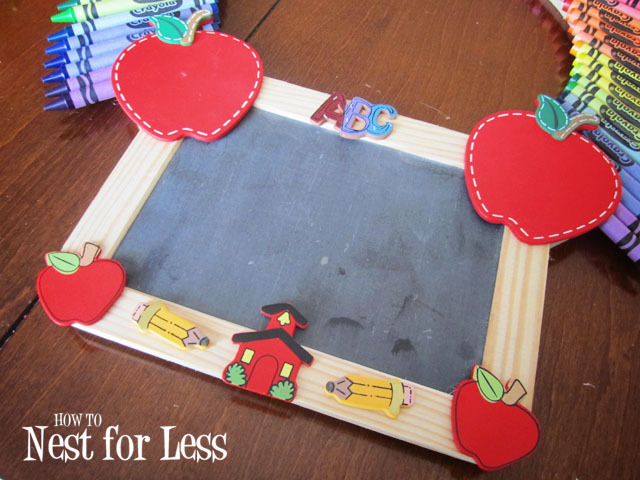 I am just wondering where you bought your mini chalkboard, wood apples and craft ring for this. I am want to make this but can’t figure out where to buy it. I live in a small town and wondered if I needed to go to the city to buy some of it. 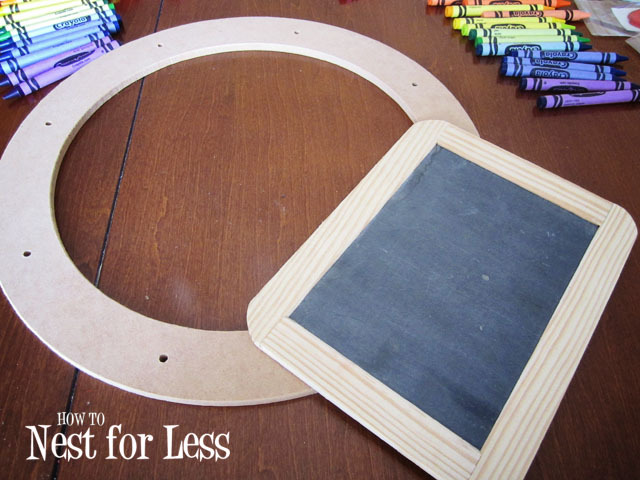 I bought the mini chalkboard and little wood pieces from Michael’s! This is so cute. Where did you get the craft ring from? I got the craft ring from Michaels! I am loving all that you do! Thank you! Hugs to you! Aww, thanks so much Judith! Adorable… but am I the only one who feels this is wasteful? I teach at a very low income school and my kids always end up going without — pens, pencils, crayons, markers, theme paper, folders, you name it, we (teachers) buy it. 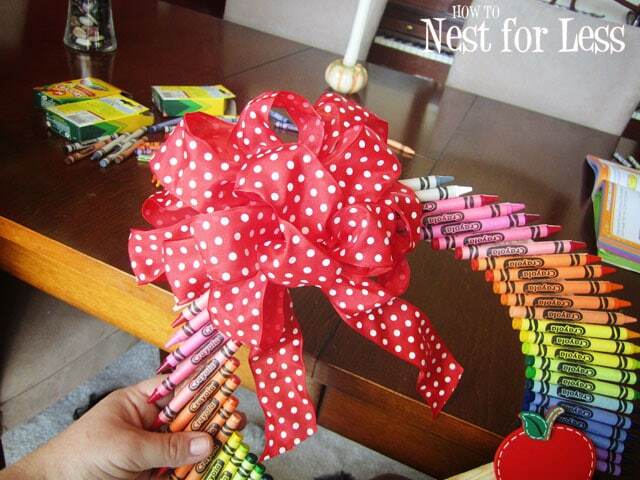 While I love the thought of making something like this (or a pencil wreath), I would feel wrong in doing so. 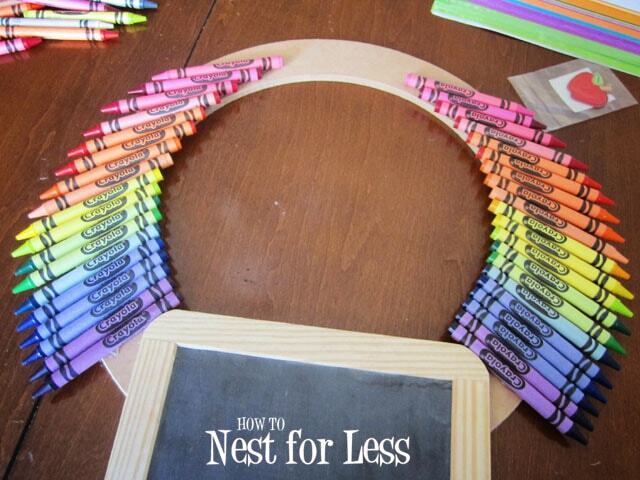 I suspect my kids would rather I just buy a pack of crayons for them to use! I really love this idea! I would like to do this for all my fellow teacher friends as an end of the year gift. Is there a way to preserve the crayons so critters don’t nibble at it or to keep crayons from breaking due to moving wreath or wear and tear? Thank u! Unfortunately I haven’t thought of one except for to store it in bubble wrap!